Inspired by a pioneering female potter, this artistic bird bistro is as strong as it is beautiful. 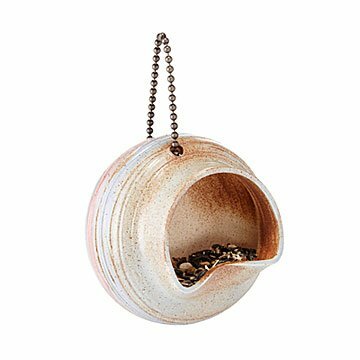 The inspiration for Jo-Anne and Gerald Warren’s gorgeous handmade birdfeeder came from a piece Jo-Anne found in her grandmother's pottery collection, designed by Susie Cooper. A UK-based trailblazer for women, she created stunningly original, wildly popular ceramics over a seven-decade career. The beautiful colors of this elegant bird bistro are an homage to her signature cheery but sophisticated palette. The Warrens throw natural Ohio stoneware clay on a potter's wheel, add the ribbon texture by hand, and individually paint the stripes with food-safe glaze. Kiln-firing at over 2,000 degrees makes these feeders strong and weatherproof. We can't prove it, but we suspect this artsy hangout will attract feminist bird aesthetes who'll tweet about Mary Cassat, Georgia O'Keefe, and Frida Kahlo while they eat... like birds. Handmade in Canada. Designed for year-round outdoor use.